If there were any doubts that Samsung's Galaxy S III is the hottest smartphone in the Android world, the latest sales figures for the handset should put those doubts to rest. In the just two months, the Samsung smartphone has broken the 10 million mark in global sales, according to the company. It took the unit's predecessor, the Galaxy S II, five months to reach that sales plateau. The sales numbers were revealed Sunday by president of Samsung's information technology and mobile communication division Shin Jong-kyun in an interview with the Yonhap News Agency. Right now, the Galaxy S III is the hottest smartphone in the market and without another Apple iPhone in sight for at least a month, it's likely to remain so for the rest of this calendar quarter. However, a new survey from 451 Research/ChangeWave shows that 14 percent of smartphone shoppers say they're "very likely" to buy the new iPhone when it's released this fall, compared to 2 percent who say they're "very likely" to buy a Galaxy S III. Apple is trying to put a crimp in the sales of the Galaxy S III by including it in a patent lawsuit filed against Samsung in the United States. That lawsuit has already resulted in a ban on sale in the U.S. of Samsung's Galaxy Tab 10.1 and Galaxy Nexus smartphone. 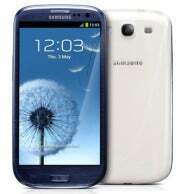 Since its release on May 29, the Galaxy S III -- which runs Android 4.0.4 (Ice Cream Sandwich), has a 4.8-inch display and a quad-core processor -- has been critically acclaimed. According to Samsung's Jong-kyun, sales of the handset could top 40 million, which would make it the all-time best selling smartphone for the company.